Few of us enjoy cleaning our homes. It's tedious and time consuming, and sometimes it seems pointless. After all, life will go on if the laundry goes unfolded or the toilet unscrubbed, right? Well, unfortunately for most people, cleaning is a necessary evil. Life is just easier when you live in a house that is tidy. That doesn't mean you have to spend all of your precious time dusting and mopping, though. 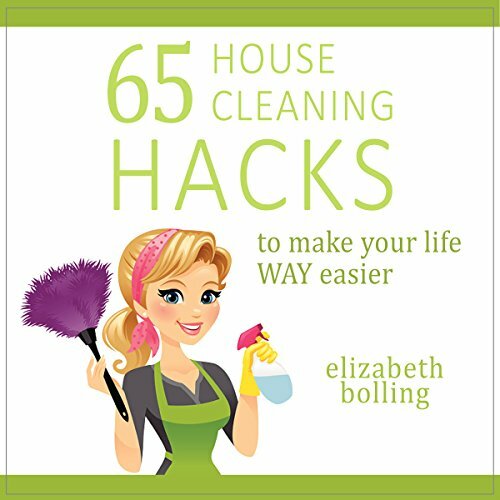 Author Elizabeth Bolling brings you her favorite tried-and-true cleaning hacks and tips, guaranteed to save you time and energy so that you can spend less time cleaning and more time doing what's really important to you! This book is for teenagers or some one who never did house work.some hacks are basic some are going around Pinterest a lot a few are new to me. This book is great for getting tips on how to clean your every day household materials and the like. Narrator very good. Book problems. Author says to start with clean house and do it in a day. Not possible with most of us. Not even that clean in a week. If I could I would not need book. Does have good cleaning suggestions. Loved it! Going to listen again but while taking notes. I recommend note taking the first time of you are short on time.